So, I had some work done on the MR2, and my garage guy said we should dyno it and see how much help the various bits have added. The last dyno run after a manual fuel pressure regulator to get A/F ratio into a good number gave me 110HP at the wheels. He said that's pretty good, and the figure about 85% of the engine HP at the wheels, so engine output should be about 129HP. Question: Is this correct? About 85% at the wheels equals engine output? Jerry wrote: So, I had some work done on the MR2, and my garage guy said we should dyno it and see how much help the various bits have added. The last dyno run after a manual fuel pressure regulator to get A/F ratio into a good number gave me 110HP at the wheels. He said that's pretty good, and the figure about 85% of the engine HP at the wheels, so engine output should be about 129HP. Question: Is this correct? About 85% at the wheels equals engine output? It's a rule of thumb that's different for every car. But.... why does it matter? Wheel horsepower is what matters. Depending on drivetrains I would say 15% is about right. Swank Force One wrote: But.... why does it matter? Wheel horsepower is what matters. the only people that care about anything other than Wheel horsepower.. drive automatics. That's a fudge factor that is primarily used to inflate the ego of the tuner or the owner. Ignore it. At the wheels is what was measured, at the wheels is what you use. The Brits, I believe, swear by flywheel hp. However, they also do a coast-down to measure the inertial losses directly. An MR2 would have a lower amount of drivetrain loss than an FR car because the power doesn't have to turn 90 degrees. "the only people that care about anything other than Wheel horsepower.. drive automatics". Gotcha. Quick question, when you see HP ratings as a new car, is that also at the wheels or engine? If it matters i use to get 115 to 118the at the wheels of our IT prepared mr2. All it had was a decked head that had some minor porting. The rest of it was stock. Jerry wrote: In reply to SCARRMRCC: "the only people that care about anything other than Wheel horsepower.. drive automatics". Gotcha. Quick question, when you see HP ratings as a new car, is that also at the wheels or engine? In 99.9% of the cases. In reply to oldeskewltoy: Eww, dyno dynamics. yamaha wrote: In reply to oldeskewltoy: Eww, dyno dynamics. here are 3 different dyno readings from my current 4AGE.. I've got three different dyno runs of the same car that show a 9 hp variance.Same car, same operator, same dyno, same day - runs are back to back even. Guess what happens when your intercooler is too small? You asked, here you go. First sheet is from last month, all we did was add a header, no cat, and fairly open muffler. Otherwise stock 4AGE in a 1987 craigslist MR2. First run as is, second and third plot of the three was when he plugged a vacuum line to the crank case and went from 100 to 104HP. This sheet is the recent one. He added a mechanical fuel pressure regulator to get the A/F ratio in good specs and I think he was going to advance the timing a bit (I wasn't there for this set so not sure.) Up to 111HP. I've seen listings for a stock 1987 MR2 at 112HP brand new. I was curious if that was engine-only, or at the wheels, and how that compared to above. That can be true, but as someone who has evidently been wronged by a dynodynamics operators twice by your reasoning(2 different locations).....so hopefully you can understand my distrust of them. They read LOW. For now... disregard the horsepower... look at your torque numbers. Look at your 110hp plot and its torque, now look at my 112hp and its torque. similar... except your hp peak appears to be @ 6590rpm** just about stock, and I'm at 7100. As I said I'm running a mild cam, so my old engine pulled a bit longer - hold a gear longer. Do me a favor... get a cranking compression reading. Let me try to recover... instead of reading your dyno sheets on GRM, I copied and pasted them into my browser.. and my olde eyes were a bit better informed. your 110 plot, and my 112 plot look very similar. nearly the same peak hp point - both well above stock 6600, nearly the same peak rpm point for the torque reading as well. THAT is why I assume(and still do) that you may have a mild street cam in there already. yamaha wrote: In reply to oldeskewltoy: That can be true, but as someone who has evidently been wronged by a dynodynamics operators twice by your reasoning(2 different locations).....so hopefully you can understand my distrust of them. They read LOW. Every dyno reads low when it's your car on it. 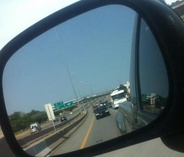 If it's someone else's car, they read high. "Next time you have those cam covers off you might check to see if those are aftermarket cams...."
Bought it on craigslist Dec 2011 from someone that had gone to FL that summer to buy it himself. Supposedly bought for daughter that ended up with different vehicle, he resold it to me. So, except for Carfax listings showing it in FL since birth, I have no history. However, it did appear that it had had some engine work by appearance and I assumed just maintenance. Or you can say Dynojets read high. If you're making comparisons on the same dyno, it's more important that the dyno is consistent from pull to pull. Load dynos are for tuning. Inertial dynos are for posting numbers on the internet. I tuned a rather well sorted IT Corrado SLC and we made a whopping 147whp on a Dyno Dynamics. Made well over my expected 170whp on a Dynojet 248c. I would only make small comparisons within a session (holding all other variables as steady as possible) and big changes on the same exact dyno. Changing any more then this, who knows unless you have track results to guide you. Fwiw sometimes its easier to tune a car on a 1/4 or 1/8mi drag strip then anywhere else. Consider this, HP is never measured, it is always calculated based on torque and RPM. it works out that the raw numbers for torque and HP are always the same at 5252 RPM. So when you look at a dyno sheet, and the two numbers are different at 5252 RPM, then something is off. Could be torque meaurement, could be RPM measurement, could be the way it's calculated. The 5252 cross only happens with ft-lb and HP. Not "etc" Use different units and they'll cross at different points - or not at all. As long as you have RPM and torque, HP is a pretty simple calculation. The most common reason to see the lines not cross at 5252 is if the torque and power lines are using different scales. Happens more than you'd think for some reason. 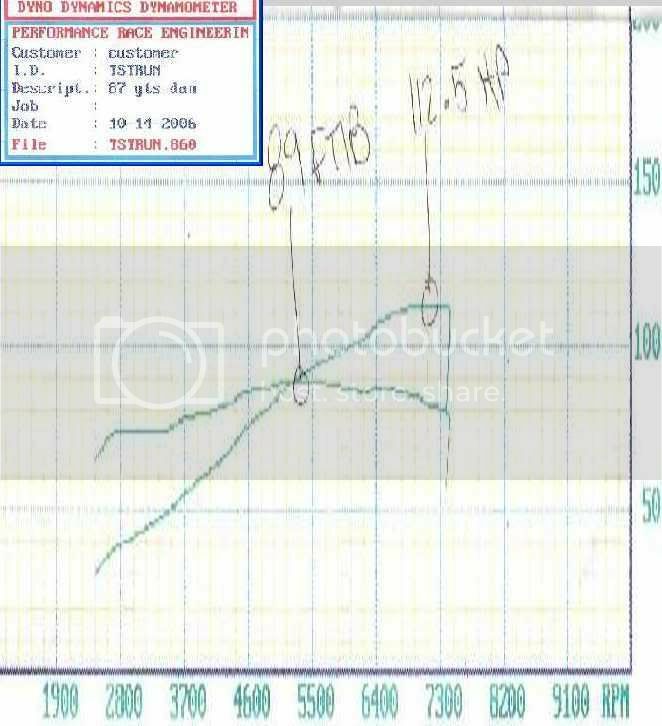 Two different dyno dynamics.....first time the car made 152whp, second time 191whp, and its only time on a dynojet, 223hp.......car in question, +3psi ion redline.